We purchased both of these fabulous beds at a local European auction and just knew they would be snatched up by clients within days. We couldn’t have been more wrong!! Both beds stayed in our inventory for over a year! Why??? I have no clue. But what is even more strange to me is that when one sold…..they both sold….within just a few weeks of each other! I’ve quit trying to predict or make sense of this market…..it’s anybody’s guess! I thought this was the perfect opportunity for me to share almost identical painted headboard / beds in two complete opposite colors. And what is up with the “black and/or white” paint trend right now?? I miss my hot pinks and turquoise orders!!! 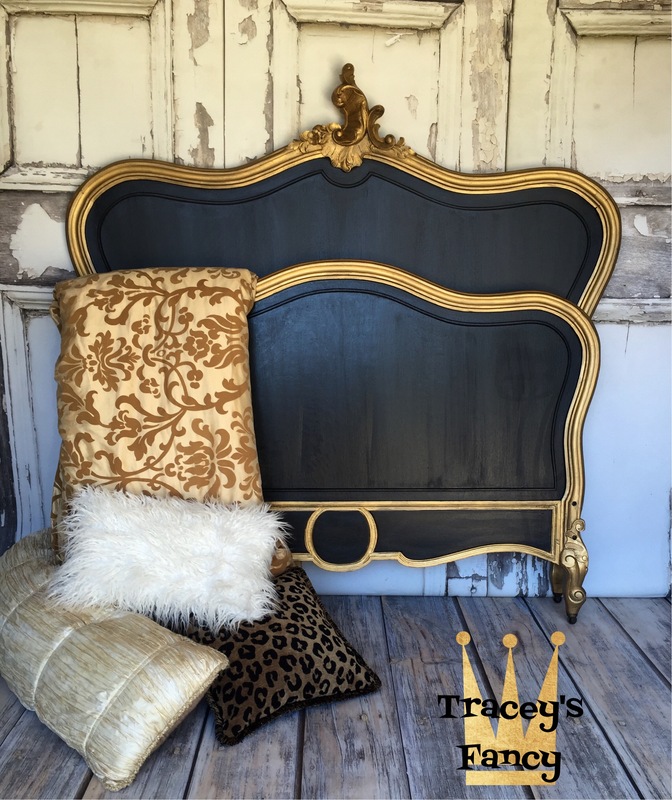 Painted Headboard #1 sold …. and the order was for a pure white trimmed in brilliant gold. Here is the “before” photo…. I know….I know…..don’t say it! I know its gorgeous and it’s a cryin’ shame to paint it…but come on people…..it is just too dark and overbearing for some decor. And it will be enjoyed and loved with new brighter colors bouncing off its frame! Like this…. 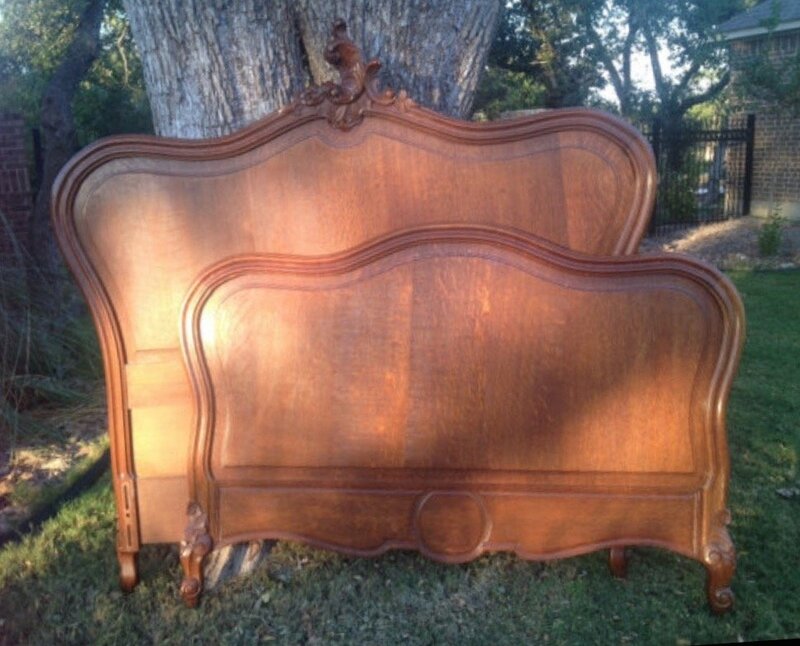 The second painted headboard sold almost immediately after I posted pics of this bed in its new splendor! However…this next client wanted it in BLACK…but with the same brilliant gold. So here is it’s before…. Basically the same painted headboard with a little less trim. And here is the end result…. Now let NO ONE mention that my photographer took the white painted headboard photos….and I took the black painted headboard photos…hence the really odd lighting. Whatever….so I’m not a photographer! You can still see the beauty! The white bed involved a little more work than the black as far as prep work goes. Chalk type paints are wonderful to work with and offer a beautiful finish. But if you are planning to paint with a light color (especially whites) over furniture that is stained wood (especially antiques)…..it is usually necessary to prep the piece to block the tannins. I’m not going to pretend that I understand the chemical reaction (I’m not a scientist just like I’m not a photographer) but I will tell you that tannins will bleed right through porous chalk type paint…and the stain likes to appear when you are completely finished and applying your coat of sealer! No fun! (Read my post here about Tannins & Bleed-throughs.) So I gave the bed a quick coat of Zinsser Shellac . It dries super fast and is a great blocker! 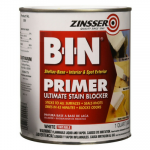 I then coated this entire piece in Zinsser Bin Primer. This will assist in blocking those tannins and will also save you a coat of paint! And the white bed is complete! What is different about the black bed??? 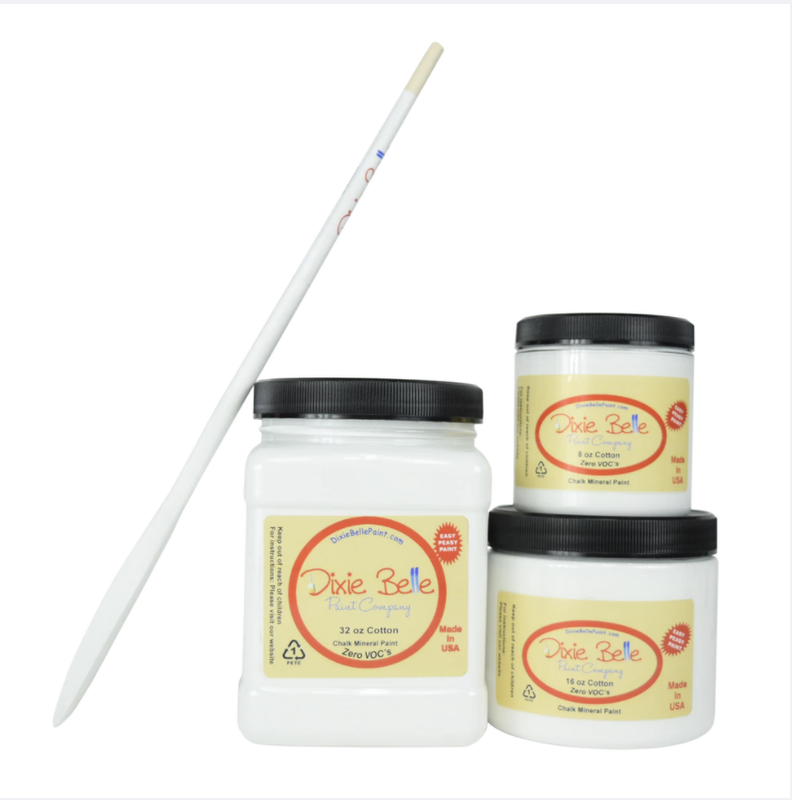 Well much less PREP because tannins will never rear their ugly heads through Caviar…..by Dixie Belle Paint Company. It is a rich deep velvety black that is as classy as it gets! I was able to apply this paint directly to the raw wood of the bed. I painted two coats for a nice full coverage. When using black chalk type paints I really like to follow with black spray wax to deepen and enrich the color even more. The spray waxes will be your friend….I promise! 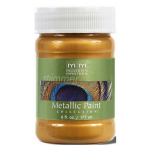 I used the exact same brilliant gold by Modern Masters in Olympic Gold . But this bed I chose to only use one coat on the trim. It went on sheer and looked fab over the black. It allowed the black to sort of peak through and gave an instant aged effect that didn’t work for the white bed. This bed was going in a young girls bedroom. I try to always go above and beyond regarding protection when working on pieces for kids rooms. So I chose to give this bed two more coats of sealer OVER the black spray wax. 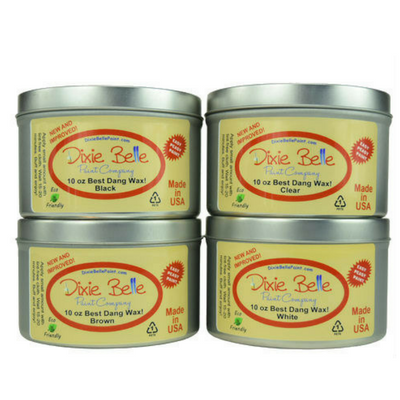 Dixie Belle sealers can be used OVER wax…as crazy as it sounds. I used Dixie Belle Top Coat in Satin. (I allowed the black wax to cure for 24 hours before applying the top coat….and allowed about 2 hours of drying time between the layers of top coat). 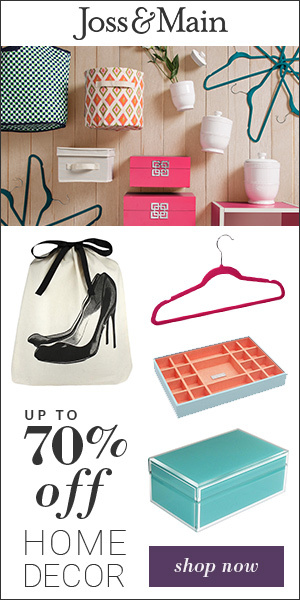 The products listed here are exactly what I used on this end table! 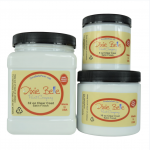 Dixie Belle Paint company offers amazing products that will make all of your projects successful no matter what your skill level! Please please please share my headboard pins and follow me on Pinterest! 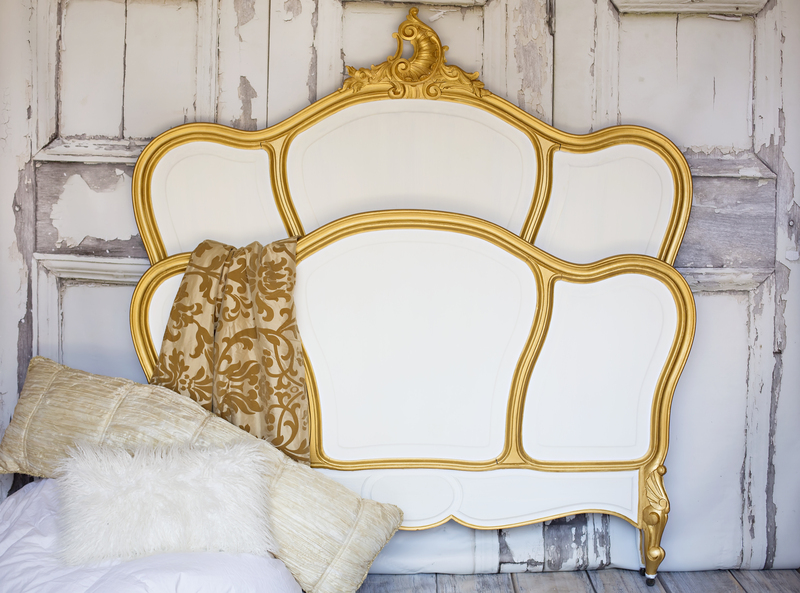 These have got to be the most gorgeous beds this side of Versailles! Thank you for sharing your process with us. 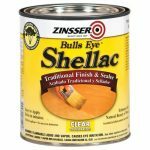 I use Zinsser Shellac, plus Ultra Guard, too. Really blocks EVERYTHING…and tannins can ruin a girl’s good mood. Beautiful project, and great post! Thank you Heather!!! They fall into the category of “do I really want to let this go” for me!!! I know you know! The beds are absolutely stunning! I bought almost same headboard/foot board yesterday. I want to do the black/gold one. I know I cannot do anywhere close to what you do as I am newbie to DIY world. But I want to give it a try. If you don’t mind, can you please tell me the steps. 1.Should I sand it or no need for black? 2. Did you first paint the whole thing black and then gold on trims? What kind of brush you used for trims. Wish you had a video doing it! Hello and thank you for signing up to follow me! I’m so excited for you to be tackling a bed of your own!!! I will make a video tutorial tomorrow …..of me just discussing and showing you paints and tools needed. I’ll send you a link once it’s done! How’s that sound??? OMG! Thank You so so much! They are sitting in my garage. I go and look at them 3 times a day but dont know where to start with. Your video and any suggestions will be so helpful. I will send you the pictures of pieces. Thanks and looking forward to hear back from you! Thank you Pamela! Thank you for taking the time to read my blog! I’m purchasing your product recommendations for the black headboard but do not see the “spray wax in Noir” offered. The web site only lists ‘soft’ and ‘liquid’. Is the liquid the spray? Hi Tracey, I just stumbled upon your blog and this was the first post I landed on. Wow, wow wow! ? Thank you Cathi! These two beds were so gorgeous even in their raw state! But I am super pleased with how they turned out! I appreciate you stopping by!!! Just stumled upon a picture of these beds on Pinterest and dropped my jaw in pure awe! I am so glad I found your blog and am now following you. 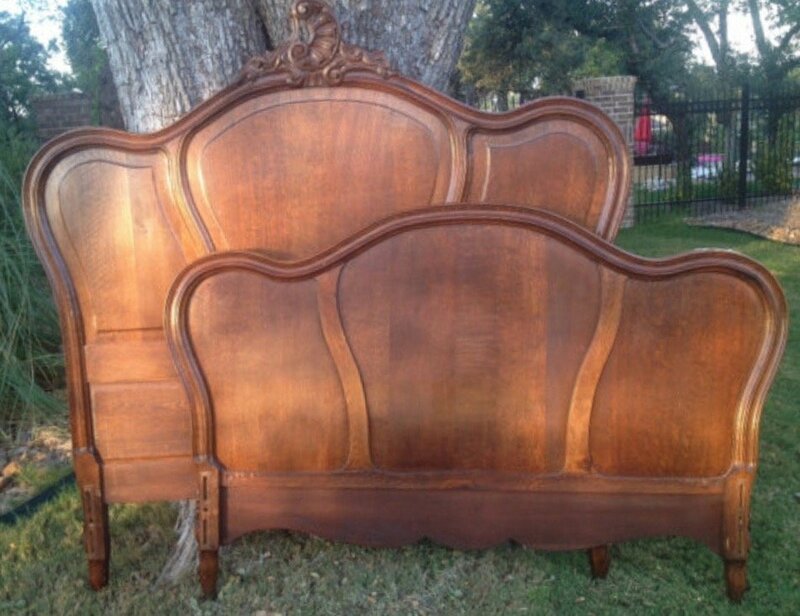 I have a pair of twin french beds that, like these, almost seemed a sin to paint, but you just made my mind up! I’d like to use them for my toddler daughters who share a room and am tempted to do PINK and gold! Do you have a favorite tried and true timeless pink you can recommend? This will be my first big project. Thanks! What color and type of paint did you use on the black one?